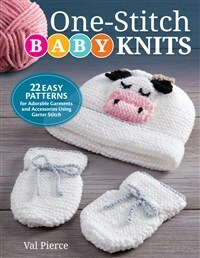 One-Stitch Baby Knits features 25 simple patterns for practical but adorable baby knits, designed for small babies aged 0-18 months. Each garment is made entirely with the garter stitch—the easiest stitch in knitting—making these projects accessible to beginners and quick and simple for more experienced knitters. Knitting and crochet have been a lifelong passion for Val Pierce, her father having taught her to knit at the tender age of 5. Having worked for many major yarn companies and various well-known designers, she decided it was time to branch out and begin making her own designs. Author of Love… Knitting, Val's work is published regularly in knitting magazines. She also teaches knitting and crochet to both adults and children.